DVB Debate: How to end hate speech? On this episode of DVB Debate, our panellists discuss the relationship between faith, race and hate speech in Burma. DVB Debate: How balanced are the civil and military powers? Burma has a new civilian government, but the military remains a powerful player in the country’s politics. Our panelists discuss how and when this can be expected to change. On DVB Debate’s National Election Debate, senior members from across the political spectrum met at the Inya Lake Hotel in Rangoon on 4 November to champion their policies ahead of the 8 November general election. Election debate: What’s at stake for Burma’s youth? A new politically charged generation has the chance to vote for the first time. What will be the issues in their minds as they go to the polls? DVB Debate: Postpone election in flood-hit Burma? A general election set for November could cap off five years of historic reform for Burma, but has disastrous flooding drowned Burma’s hopes for democracy? DVB Debate: How to solve the boat crisis? On this special episode of DVB Debate, the panel discusses Burma’s role in the regional migrant crisis. DVB Debate: How will non-citizens survive without white cards? In this week’s episode of DVB Debate, the panel questions the government’s motives for annulling white cards, and ponders what is next for former holders within the persecuted Rohingya minority. DVB Debate: How would Burma manage another natural disaster? On this week’s episode of DVB Debate, the panel asks whether the police use of civilian thugs to put down protests can be legally justified. DVB Debate: Has Burma’s reformist government kept its promises? Exactly four years have passed since Thein Sein’s reformist government was sworn in. But has Naypyidaw lived up to its promise of democratisation? This week’s DVB Debate comes at a time when Sino-Burmese relations are under the microscope. DVB Debate: What role for exiles in reforming Burma? On this week’s episode of DVB Debate, the panel sizes up the political and economic role for former exiles and economic migrants in a new Burma. On this week’s episode of DVB Debate, the panel discusses the impact that mobile technology has had on Burmese society since the sudden and widespread introduction of cheap SIM cards and smartphones. DVB Debate: Is it possible to be a leader without joining the military? Aung San was famed as a solider and a politician. Many current Burmese leaders wish to emulate the man, but is it possible to be a civilian leader in Burma? Burma is undergoing a period of mass urbanisation. Can Rangoon and Mandalay handle the influx of people? As students continue protests across the country, DVB Debate examines the National Education Law. Millions of Burmese households remain in the dark, with only one third having access to regular electricity. More dams will mean more electricity, but where will it flow? Nationalism is a powerful force in Burma, but is it a positive one? DVB Debate looks at the place of persons with a disability in Burmese society, and discusses what must change to ensure equal opportunities for all. DVB Debate’s first all-female panel dissect the elements in Burmese law and society which contribute to the problem of sexual violence and gender discrimination. 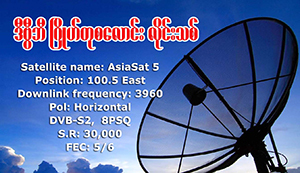 In this episode of DVB Debate, the studio examines what a modernising telecommunications market means for Burma. Are ethnic voices being heard? DVB Debate: Can federalism be the solution? On this episode of DVB Debate, a panel of ethnic leaders and political analysts discuss the future of federalism in Burma. DVB Debate: What’s missing from Burma’s education system? Education in Burma’s is ranked amongst the worst in the world. In DVB Debate’s taxes and services episode, the studio asks if taxation will lead to democratisation. Panellists on DVB Debate discuss how to protect the millions of migrant labourers who leave Burma in search of work. Panellists on DVB Debate question whether the Peaceful Assembly and Peaceful Procession Act is being used to persecute activists.